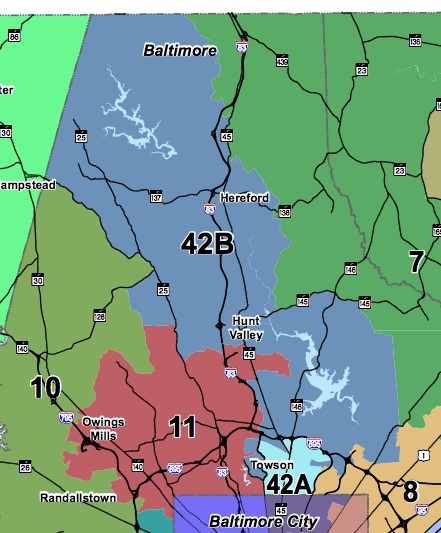 Redistricting altered substantially the boundaries of Baltimore County’s District 42. 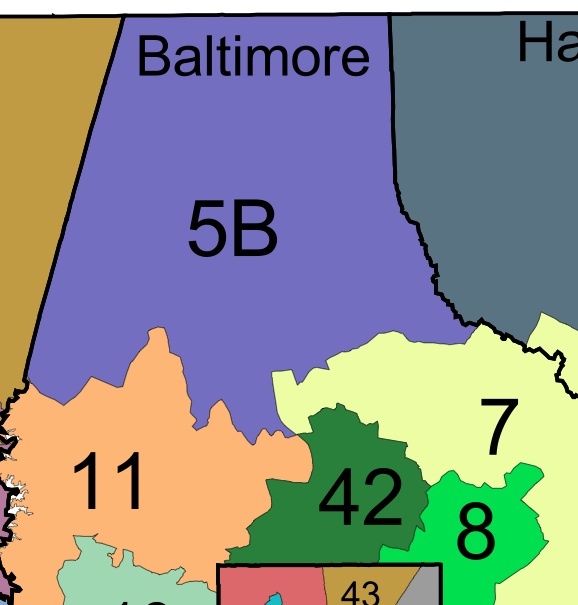 While the new district extends from the Baltimore City boundaries to Pennsylvania and is divided into two subdistricts for delegate elections, the old district (shown below) was a much smaller section of territory concentrated close to the City with no subdistricts. The new boundaries seemingly take in many new Republican voters, adding red territory in the northern part of the County and losing Democratic Pikesville precincts. The new District 42 is split in two with District 42B (two delegates) a GOP bastion and District 42A (one delegate) safe for the Democrats. The map below helps capture the partisan complexion of the area with bluer areas more Democratic and red areas more Republican (from Dave’s Redistricting). Miller said Brochin has not asked him for help in the race. “It’s very rare that I get involved in a Democratic primary,” said Miller, who has used a Senate PAC to funnel money to help Democratic incumbents get reelected. “I wish them both well in the primary,” he said. Miller is famously blunt when he wants to be–reporters surely bless him daily. But Miller’s lack of support for Brochin is unusual for Miller. He is fiercely protective of his caucus and normally backs them to the hilt in primary as well as general elections. The absence of Miller’s support speaks volumes. Brochin casts himself as the most independent and bipartisan member of the Senate. Some might assume that the new lines are punishment for failure to toe the liberal line. Certainly, the unions have joined O’Malley in lining up behind DeJuliis. Politics is a team sport and Brochin’s independence can cost him friends. His support for marriage equality thrilled Equality Maryland but his vote against trans equality in the last session had the opposite effect. Picking a side can build allies. But lots of members of the legislature stray while remaining in the good graces of colleagues. Members of the Democratic leadership are often quite understanding of legislators who cannot support them on a tough vote. Del. David Rudolph is extremely well-liked yet one of the most conservative Democrats in the House. Brochin’s problems lie not so much in his conservatism as his unpredictability. He likes to keep people guessing and changes sides frequently–characteristics that frustrate colleagues who value knowing where you stand, at least privately, with some regularity. While the intent to hurt Brochin seems clear, and Brochin hated the new district lines enough to sue unsuccessfully over them, it is a bit murkier to me. As much as O’Malley and Miller might be happy to toast Brochin’s departure, neither wants to lose a Democratic seat. The evidence that the new district is drastically less safer for Democrats is pretty thin on the ground. The old district elected two Republican delegates, though Brochin managed a comfortable if not overwhelming 58% in 2010. In the Senate race for the new district, the Democrats are also looking good. The one Republican in the race has $7K in his campaign account–Bob Ehrlich’s endorsement hasn’t exactly raked in the cash. Looks like a far more exciting battle for the Democratic nomination between Brochin and DeJuliis. In the fundraising battle, Brochin has $229K in the bank compared to just $42K for DeJuliis. But she can raise money during the session while Brochin cannot. On the other hand, various interests might not want to cross him during the session. Money is not everything and DeJuliis could well be on her way to having enough funds to be competitive. Her union backing could give her a wealth of volunteers. However, DeJuliis won her sole delegate election in 1990, so this is not the same as the classic delegate-senator matchups elsewhere. DeJuliis narrowly last the primary for the 2nd Congressional District with 35% in 1994. She received the nomination in 1996 but got badly beat by Bob Ehrlich. All of which is ancient electoral history at this point. Brochin looks well positioned to win both the primary and the general. Still, even if Brochin wins, O’Malley and Miller sure have made him sweat. On the House side, Del. Stephen Lafferty can breather easier in cozily Democratic 42A with $86K in his campaign account. Del. Susan Aumann ($63K available) looks ready to coast to reelection in Republican 42B with others battling it out for the second GOP nomination. So far, only one Democrat has even bothered to file in the two seat subdistrict.